﻿ Suite De Ville Da Nang Beach (Vietnam) | FROM $14 - SAVE ON AGODA! "Friendly staff all around, breakfast was great, super nice l..."
Have a question for Suite De Ville Da Nang Beach? 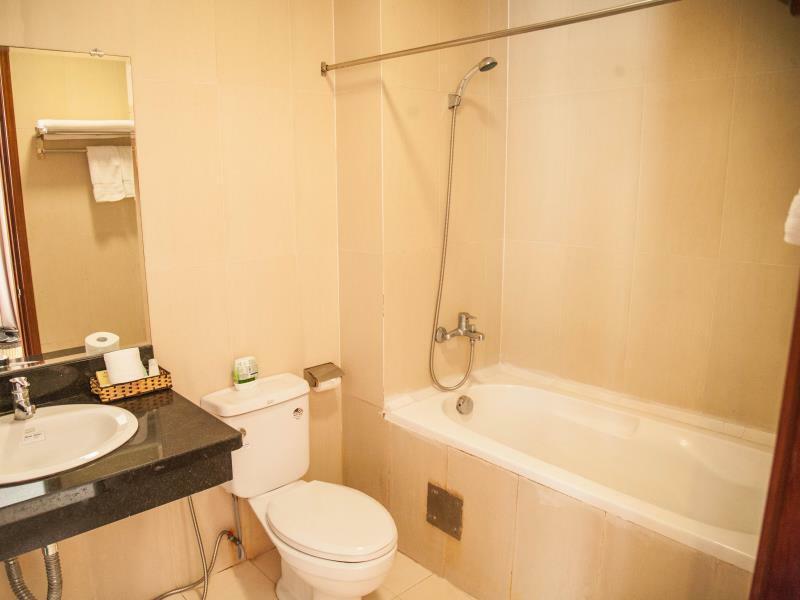 "This hotel is very clean, wide and peaceful." 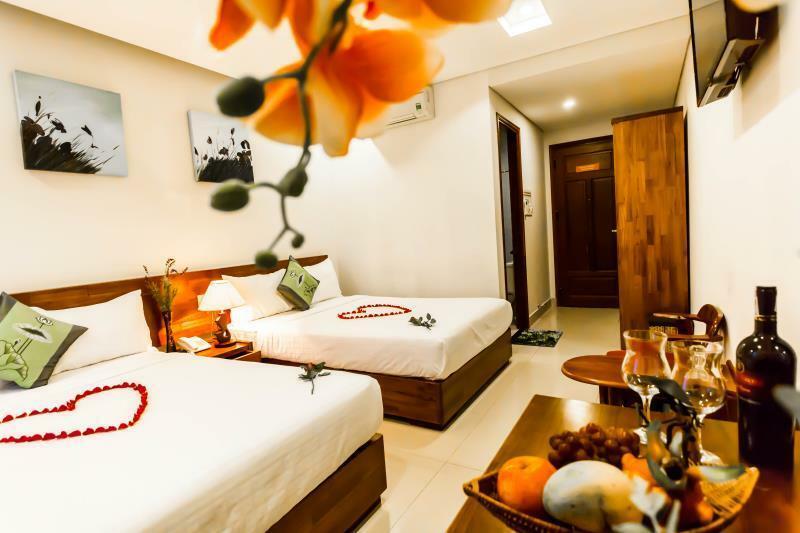 "Nice hotel, good value for money"
Well-positioned in Phuoc My, Suite De Ville Da Nang Beach is the ideal point of departure for your excursions in Da Nang. Only 5 km away, this 3-star hotel can be easily accessed from the airport. With its convenient location, the hotel offers easy access to the city's must-see destinations. 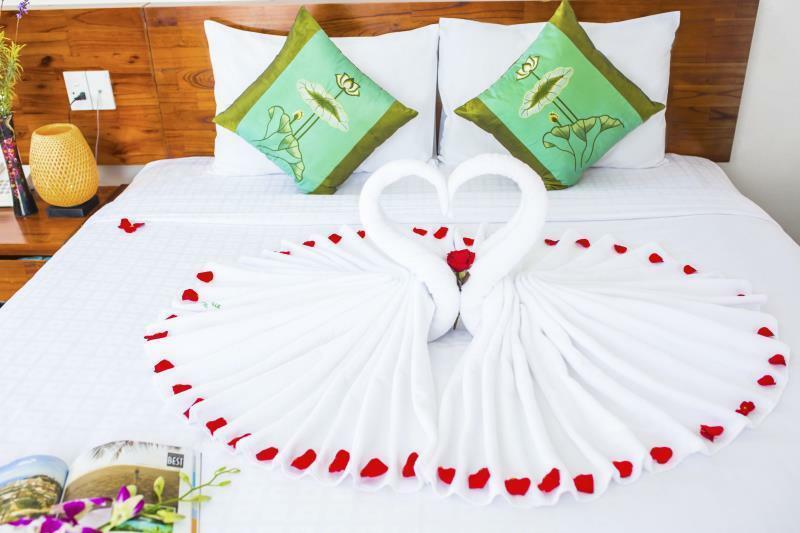 The facilities and services provided by Suite De Ville Da Nang Beach ensure a pleasant stay for guests. The hotel offers access to a vast array of services, including free Wi-Fi in all rooms, 24-hour security, daily housekeeping, gift/souvenir shop, postal service. Experience high quality room facilities during your stay here. Some rooms include television LCD/plasma screen, cleaning products, clothes rack, complimentary instant coffee, complimentary tea, provided to help guests recharge after a long day. Besides, the hotel's host of recreational offerings ensures you have plenty to do during your stay. 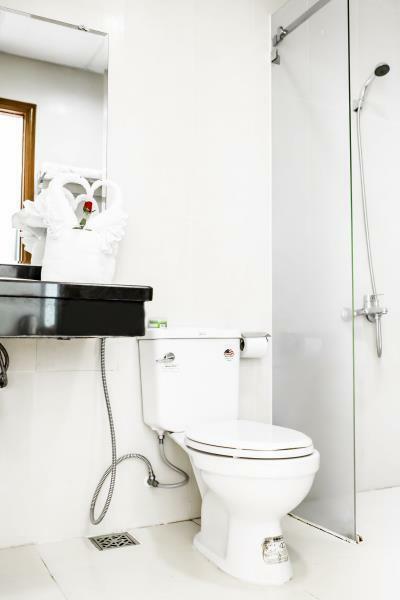 When you are looking for comfortable and convenient accommodations in Da Nang, make Suite De Ville Da Nang Beach your home away from home. Hotel have room with compliment of free breakfast regarding to its price compared to its peers. I just don't like the bathtub, instead I prefer the standing shower, it's just my opinion. Well recommended! We stayed in a deluxe room and it was impressive, taking into account how much we paid, probably because of the low season. But everyday room service, Vietnamese style breakfast included, we literally paid just for our breakfast! The only big minus - the lobby turnes out into a garage for the moto bikes at night time and guests (or who they are ) smoke in the lobby, which is not acceptable. Overall, not new, building contructios around (but not a big noise), dirty around the place but it turned out as a great value for money. Staff was ok. Hotel looked nice on outside but old on the inside. Room had funny smell, had a tub with mold growing on it and only the shower rod and no shower curtain. We requested another room. New room still smell funny. Bathroom had only shower rod and no curtain. We slept there one night and then booked another place. Was not worth arguing with front desk that their hotel was too dirty to stay at. Booked at Ruby Light Hotel. Same price but super clean and no funny smell. 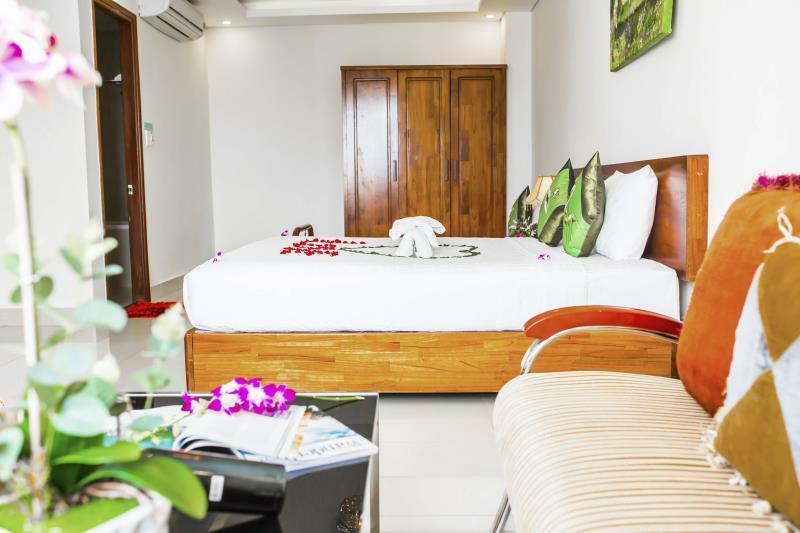 This was a very nice stay, and because of deep discounts on Agoda it was a very good value. The staff were professional and friendly. I gave a slight downgrade because the buffet breakfast is pretty ordinary. While the location is a bit south of the main beach area, it’s only a couple of hundred meters from a beautiful beach. Overall, worth a serious look. For the money the place was extravagant. The rooms were large and very clean. I had the king size bed with with the ocean view and the bed was one of the best I have ever slept on. The staff was excellent and very friendly. The owner was also very personable and checked many times on how my stay was. Also invited me to have Basil Tea with him, friends and family under the covering of the front of the hotel while the cool ocean breezes blew. Was a wonderful stay and there were many beautiful places to see in Danang. I Highly recommend this place to anyone who wishes to visit Danang. It would definitely be my choice when returning! The rooms are big, clean and had everything I needed. The hotel is located only 1.5 blocks from the beach. Not too many restaurants in the immediate area, but there are some 300-400 meters away. The breakfast buffet has both asian and western dishes. Nice stay overall. Thank you for your satisfaction. 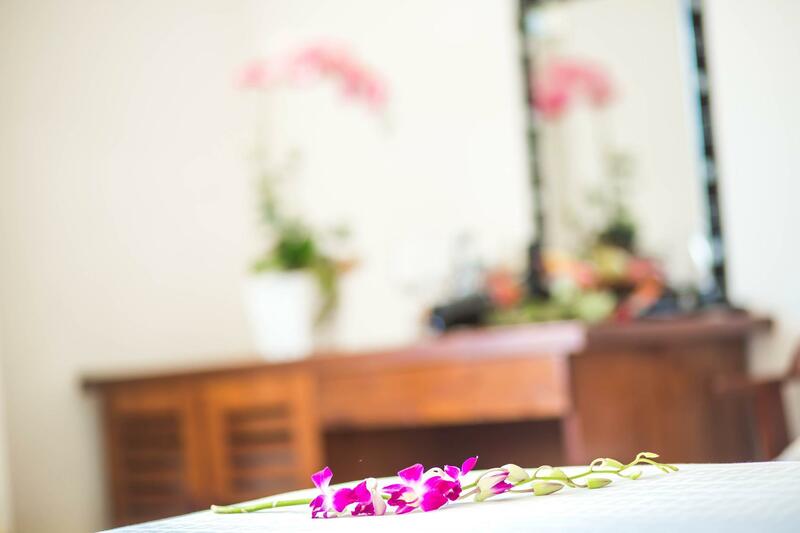 We look forward to serving you in your next visit to Danang. Thanks and best regard! My stay at the KC 2 was very pleasant from start to finish. The rooms are big and clean, the staff helpful, and the breakfast was very good with lots of options. The only drawback was the number of large groups that visited and made noise in the hallways. Luckily, after 10pm, things quieted down. I will stay here again. Great value once again here in Vietnam, you sometimes wonder how they make ends meet. I paid 17 usd for a big room. Wifi works all the time and is fast enough. The breakfast buffet was of course not world class as it's basically a budget hotel but remarkable for what I paid for the room. The beach is a short walk away and it's a long beach with not too many tourists like Phuket. Nice. You don't have many stores around, a few restaurant within ten min. of walk, generally speaking Da Nang is quite a sleepy town though I liked the landscape of sea and river with brigdes. The pillows didn't smell very well, need to add that. I would recommend this hotel and would go back there due to the great value you get! Với mức giá cả rất hợp lý, lại bao gồm bữa sáng theo tôi là rất đáng tiền. Phòng sạch, có khăn tắm đi biển riêng không dùng chung khăn trong phòng. Vị trí gần biển, đối diện có cửa hàng bán đồ đặc sản để mua về làm quà có nhiều loại và giá cả phải chăng. Bữa sáng không nhiều món nhưng hầu hết đều ngon, tôi thích nhất bánh bột lọc và bánh cuốn, trẻ con thích bánh mì. Cà phê trong bữa sáng ngon. Nhân viên thái độ nhã nhặn, lịch sự. Khách sạn còn có luôn dịch vụ xe taxi 4, 7 chỗ đỗ tại cửa. Nói chung là dịch vụ tốt so với mức giá. Lần sau có dịp lại đến! Friendly staff all around, breakfast was great, super nice location with a nice convenience store across the street and the beach a block away. Be mindful that walls are thin. Super awesome cleaning staff that'll clean the beach sand you'll likely track in. Drug smell made our team unaffordable. Ask them to change room, they said ok but we have no staff, pls move the extra bed yourself. Good location and not bad breakfast, but if you are not lucky enogh then it might be unforgettable memory. The room could have been cleaner, the tub was dirty, no shower curtain, not enough outlets. Neighhood has lots of garbage and construction.